EL RODEO, Guatemala (AP) — A fiery volcanic eruption in Guatemala sent lava flowing into rural communities, killing at least 25 as rescuers struggled to reach people where homes and roads were charred and blanketed with ash. The death toll rose late Sunday with 18 bodies found in the community of San Miguel Los Lotes, disaster agency spokesman David de Leon said, adding to the seven victims previously confirmed elsewhere earlier in the day. At least 20 people were injured, and authorities have said they feared the death toll could rise with an undetermined number of people unaccounted for. 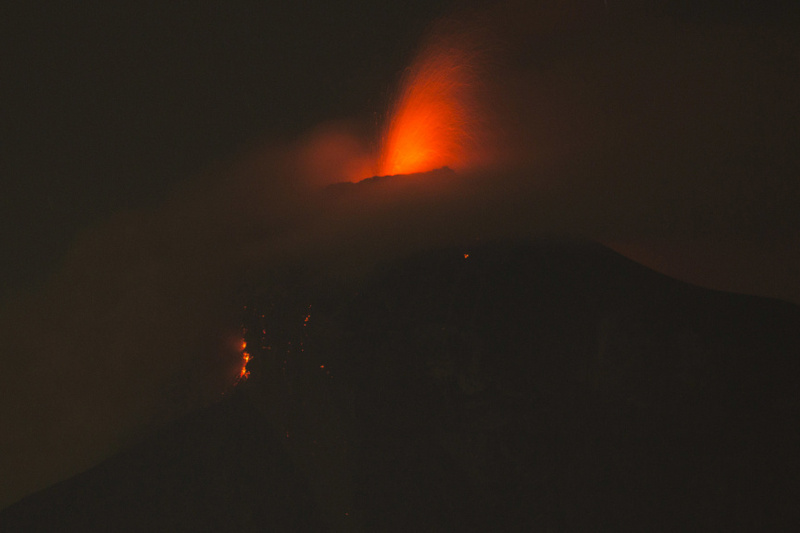 The Volcan de Fuego, or "Volcano of Fire," exploded in a hail of ash and molten rock shortly before noon, blanketing nearby villages in heavy ash. Lava began flowing down the mountain's flank and across homes and roads around 4 p.m.
Eddy Sanchez, director of the country's seismology and volcanology institute, said the flows reached temperatures of about 1,300 degrees Fahrenheit (700 Celsius). Dramatic video showed a fast-moving lahar, or flow of pyroclastic material and slurry, slamming into and partly destroying a bridge on a highway between Sacatepequez and Escuintla. Sacatepezuez television published images of a charred landscape where the lava came into contact with homes. Three bodies lay partially buried in ash-colored debris from the volcano, which lies about 27 miles (44 kilometers) from Guatemala City. Other videos from local media showed residents walking barefoot and covered in muddy residue. "Not everyone was able to get out. I think they ended up buried," Consuelo Hernandez, a resident of the village of El Rodeo, told the newspaper Diario de Centroamerica. "Where we saw the lava fall, we ran to a hillside" to escape, she added. Homes were still burning in El Rodeo late Sunday, and a charred stench hung over the town. Hundreds of rescue workers, including firefighters, police and soldiers, worked to help any survivors and recover any more bodies amid the still-smoking lava. Firefighters said they had seen some people who were trapped, but roads were cut by pyroclastic flows and they had been unable to reach them. Amid darkness and rain, the rescue effort was suspended until early Monday morning, municipal firefighters' spokesman Cecilio Chacaj said. Among the fatalities were four people, including a disaster agency official, killed when lava set a house on fire in El Rodeo village, National Disaster Coordinator Sergio Cabanas said. Two children were burned to death as they watched the volcano's second eruption this year from a bridge, he added. Another victim was found in the streets of El Rodeo by volunteer firefighters, but the person died in an ambulance. At an ad-hoc morgue in the town of Alotenango, at least three bodies lay covered with blue sheets. Guatemala's disaster agency said 3,100 people had evacuated nearby communities, and ash fall from the eruption was affecting an area with about 1.7 million of country's 15 million or so people. Shelters were opened for those forced to flee. "Currently the volcano continues to erupt and there exists a high potential for (pyroclastic) avalanches of debris," the disaster agency said late Sunday via Twitter, quoting Sanchez, the director of the seismology and volcanology institute. Ash fell on the Guatemala City area as well as the departments of Sacatepequez, Chimaltenango and Escuintla, which are in south-central Guatemala around the volcano. Streets and houses were covered in the colonial town of Antigua, a popular tourist destination. Aviation authorities closed the capital's international airport because of the danger posed to planes by the ash. One of Central America's most active volcanos, the conical Volcan de Fuego reaches an altitude of 12,346 feet (3,763 meters) above sea level at its peak.